Over 350 guests, including sustainability experts, journalists and fashion industry professionals gathered in London on Wednesday 11th October for the fourth Kering Talk, where Marco Bizzarri, President & CEO of Gucci, was the guest of honour and keynote speaker. 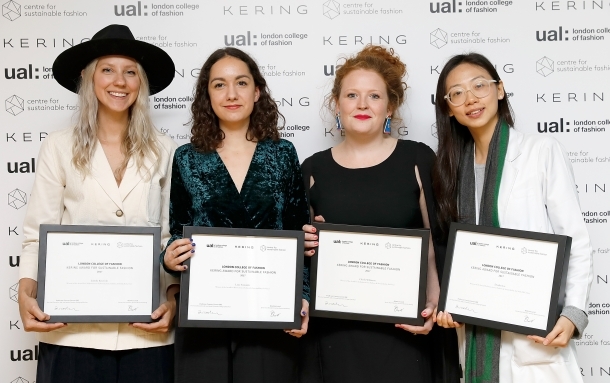 Kering and Centre for Sustainable Fashion at London College of Fashion, UAL, revealed the winners of the 2017 Kering Award for Sustainable Fashion. As part of the 2017 Kering Award for Sustainable Fashion, Gucci and Stella McCartney set 100 London College of Fashion students a sustainability challenge from which ten finalist projects were selected. Today, the 2017 Kering Award for Sustainable Fashion was presented to four outstanding students: Laure Fernandez and Charlie Wilkinson for Gucci; and Dianjen Lin and Jennifer Kusowski for Stella McCartney. This year’s projects showed exceptional ingenuity and a multidisciplinary approach, blending science, technology and design. Laure Fernandez created a new method of designing and printing patterns, using microbial pigments, while Dianjen Lin undertook promising preliminary research into producing clothing that absorbs CO2. Both these winners will receive a €10,000 grant to allow them to continue their research. Charlie Wilkinson’s project aimed to replace the plastic inner materials in Gucci’s luggage with cork and bio-resin, while Jennifer Kusowski developed a proposal for the UK’s first fibre shed. Charlie and Jennifer have been awarded an internship at Gucci and Stella McCartney respectively. This year’s 10 finalist students all showed remarkable talent and tenacity. They demonstrate how important sustainability and social consciousness is to today’s young thinkers and creators. All finalists, coming from disparate academic disciplines and backgrounds, showed a profound commitment to sustainable practices in business, together with a deep enthusiasm for fashion and nature. For the academic year 2017-18, Kering is pleased to announce that our luxury brands, Alexander McQueen and Pomellato, will partner with London College of Fashion, UAL. Dedicated press kit available on www.kering.com. All high-resolution visuals are available here. Laure Fernandez is a fashion designer who trained in the UK and France, specialising in material finishes. She was raised in the South of France and has worked in Paris, Sydney and in the Netherlands, latterly as a Couture Assistant at Iris Van Herpen. She is currently studying MA Fashion Futures at London College of Fashion, UAL. “Future Artisans” merges science with sustainable materials and creates a unique method to design patterns as well as explore the future of printing processes. The process uses natural, microbial pigments and applies external stimulus, such as sound vibrations, to cause the micro-organisms to expand, forming beautiful, unique coloured patterns. Charlie Wilkinson is a designer and maker, specialising in leather bags and accessories. She is currently studying BA (Hons) Fashion Bags and Accessories: Product Design & Innovation at Cordwainer’s at London College of Fashion, UAL, and has worked at Dr Martens as an Accessories Design Assistant. Charlie has won several awards for her work and was recently commended for her work with cork as a sustainable material by the Ethical Trade Initiative. “X Sunday” aims to replace the structural materials within Gucci’s hard luggage, replacing plastic and leather with a mixture of cork and bio-resin. Cork and bio-resin have the added benefit of being both lightweight and durable as well as sustainable. The second part of the project addresses the issues around wear and tear of the outer materials of luggage. When the structural integrity of the luggage remains intact but the outside is worn, customers are encouraged to update their luggage with specially designed wraps to prolong the lifespan of their luggage. Dianjen Lin is a designer with 6 years of professional experience across costume/fashion design, photography, art and silver metalwork. Born and raised in the Taiwanese countryside, she has an innate awareness of the symbiosis between humanity and nature. She is particularly interested in science, technology and ecological ethics. Dianjen is currently studying MA Fashion Futures at London College of Fashion, UAL. Her project "Regenerative Sustainability Activism” aims to make sustainability as easy and accessible as putting on an item of clothing. Dianjen has begun researching the development of Post-Carbon material, i.e. materials that absorb CO2. While her research is still in the preliminary phases, she has merged algae cultures with fibres and her initial results have been promising: one Post-Carbon T-shirt can produce 4% more oxygen than generated by a tree. Jennifer is a fashion designer with over seven years of industry experience as a denim specialist. She has worked in both the womenswear and the childrenswear markets and was responsible for the successful relaunch of the My First Denim collection for babyGap. She also designed, developed and sourced the first-ever organic denim trouser for the baby department. Jennifer is currently studying MA Fashion Futures at London College of Fashion, UAL. “Designing Denim with Nature” aims to develop the UK’s first "fiber shed". A fibre shed is a circular system where textiles are designed, sewn, grown, processed, sold, worn and composted locally, in a specific region. This allows for complete traceability into the origins of the textiles, and works towards removing the use of toxic dyes and synthetic finishes. A global Luxury group, Kering develops an ensemble of luxury houses in fashion, leather goods, jewellery and watches: Gucci, Bottega Veneta, Saint Laurent, Alexander McQueen, Balenciaga, Brioni, Christopher Kane, McQ, Stella McCartney, Tomas Maier, Boucheron, Dodo, Girard-Perregaux, Pomellato, Qeelin and Ulysse Nardin. Kering is also developing the Sport & Lifestyle brands Puma, Volcom and Cobra. By ‘empowering imagination’, Kering encourages its brands to reach their potential, in the most sustainable manner. The Group generated revenue of €12.385 billion in 2016 and had more than 40,000 employees at year end. The Kering share is listed on Euronext Paris (FR 0000121485, KER.PA, KER.FP). London College of Fashion, UAL is a world leader in fashion design, media and business education. In boundary-pushing research where fashion intersects with science, engineering, and technology, and in enterprise, where it partners with top brands and helps launch new businesses. It has been nurturing creative talent for over a century, offering courses in all things fashion. Across every subject, it encourages students to examine the past and challenge the present. To have inventive, assertive ideas that challenge social and political agendas. It gives them the skills, opportunities - and above all, the freedom - to put those ideas into practice. LCF moves fashion forward, by looking beyond it. We partner with fashion’s most successful brands and labels - both high street and luxury. LCF graduates are in key positions across every dimension of the fashion industry, from established designers like Jimmy Choo OBE, Sophia Webster and JW Anderson to rising stars like Ryan Lo and respected entrepreneur and former Chairman of the British Fashion Council, Harold Tillman CBE as well as fashion journalists Melanie Rickey and Sarah Harris. Centre for Sustainable Fashion (CSF) is a Research Centre of the University of the Arts London based at London College of Fashion which was founded in 2007 by Professor Dilys Williams. Their work explores vital elements of Better Lives London College of Fashion’s commitment to using fashion to drive change, build a sustainable future and improve the way we live.